Let’s talk about fiber cement siding and just what makes it our preferred recommendation to clients who are looking to replace the exterior siding on their homes. And there’s even more good news about fiber cement siding—it’s not just affordable, it provides a terrific return on investment in the form of adding value to your home, a layer of insulation that can cut heating costs. Although this “miracle” siding has only been around for the past 25 years, This Old House reports that 15 percent of new homes—and many TOH TV projects—are now being clad with fiber cement. Many architects insist on it! 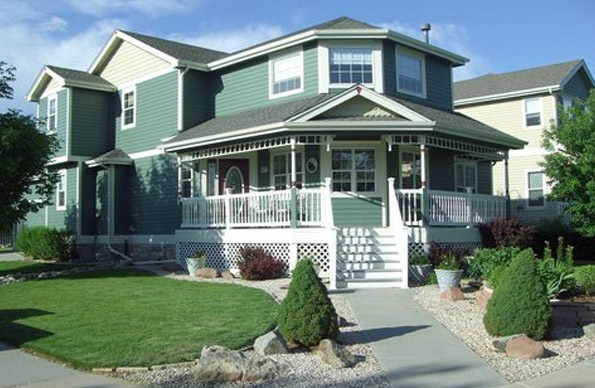 Did you know: Fiber cement siding is even accepted for use in some of Colorado’s many historic districts. Let’s take a closer look at the advantages of fiber cement siding. Colorado is a place of weather extremes: blazing ever-present sun, heavy UV exposure, buffeting gale force winds, extreme changes of temperature within a week or even a day, heavy blankets of snow, sudden and violent hailstorms, bitter sub zero temperatures in the winter, raging summer wild fires . . . are we leaving anything out? It is impervious to the sun’s UV rays. They will not blister the color off it. It does not contract or expand with temperature extremes the way wood or vinyl does, meaning the paint finish won’t chip or peel. It is not combustible, meaning that while it cannot save your home from a fire, the substance itself will not burn. Therefore, it will not add any fuel to the fire. It laughs at the idea of being damaged by either pests or any kind of mold or rot—they simply cannot touch it. So whether you have a mountain cabin in a wildfire area, a ski lodge in a heavy snow and bitter cold area, or a suburban Colorado residence in a covenant community where you need to keep your home looking well-maintained at all times, fiber cement siding will give you the exact benefits you’re looking for. In our experience, it truly is the wonder product!